You can create a horseshoe table (and other complex table types) by composing it from basic table shapes. Typically you will use a serpentine table plus a banquet table for each 'sprig'. If you need to add guests at the end of the banquet tables you can use custom tables instead. See the sample horseshoe table plan shipped with PerfectTablePlan for an example. The samples are usually installed into Documents\PerfectTablePlan. 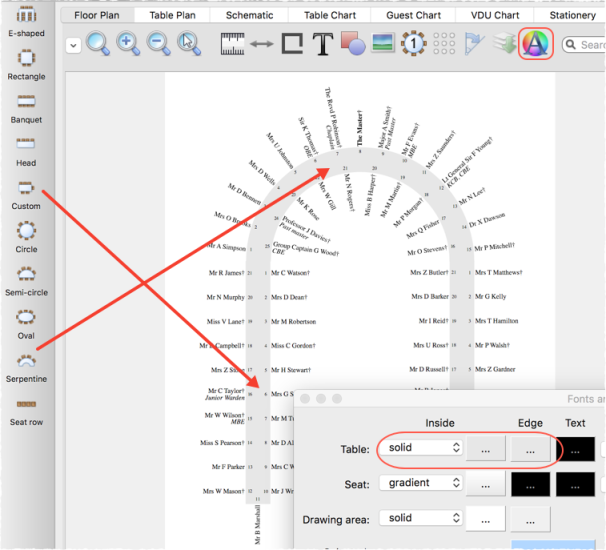 •Set the Inside and Edge colours of the tables the same in the Fonts and Colours window so that you won't see where the tables overlap. •Turn the grid snap off. •Use the keyboard arrow keys to make small adjustments to the positions of selected tables.